Grease a large Bundt cake pan. Combine white and brown sugar, oil, eggs and vanilla. Beat with mixer or a large hand whisk for one minute until smooth. Add cocoa, flour, salt, baking soda and baking powder. Stir briefly then slowly add in coffee, stirring at the same time, to make a smooth, somewhat loose batter. Spoon batter into pan. Bake for 65-72 minutes. Top should spring back when touched. Let cake cool in pan for 30 minutes and then invert on wire rack. In a small saucepan, melt 3 tablespoons butter with 2 ounces chopped chocolate over low heat. Stir in powdered sugar alternately with water until of desired consistency. Place cake on a serving plate and drizzle chocolate glaze over it with a spoon. Oh no! Another inch LOL! 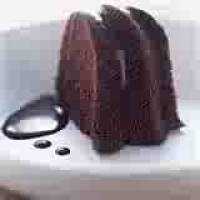 Looks very moist and chocolately, bookmarking it to make. Great post, you have my 5 also. Like falafel_fanatic's recipes? Never miss an upload!